The YL was designed with turbocharging very much in mind. For this reason, unlike the RXS and the RPL, the YL featured direct injection and a four-valve cylinder head. A 12 cylinder prototype was completed in the summer of 1950 for development testing. The YL series was introduced and exhibited at Colchester in May and June 1951. (1) Apart from one 8YLX despatched to Westland Aircraft at Yeovil in 1953, production of the YL really commenced in 1954. The YLC, an intercooled version of the turbocharged YLX, was introduced in 1955. The additional advantages of intercooling quickly became apparent and, after a short while, the YL and YLX versions were withdrawn, leaving only the YLC being offered. As well as being built in Colchester, a number YLs were made under licence in France and Italy. 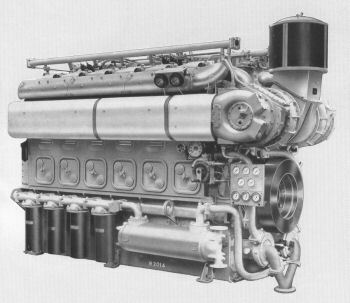 By the end of 1966 a total of fourteen YLs, in 8, 12 and 16-cylinder sizes, had been assembled in France by Forges et Chantiers de la Méditerranée SA at Le Havre (probably using parts supplied by Colchester). In Italy over forty 12-cylinder YLs were built by Fabbrica Automobili Isotta Fraschini e Motori Breda, for rail traction. Breda incorporated certain design modifications of their own, including an underslung crankshaft. Paxman staff who had dealings with the YL spoke highly of it and say it proved a very reliable engine in service. The late Denis Turner considered it one of the best engines ever made by Paxman. Although designed to run at speeds of up to 900 rpm (later 1,000 rpm), Denis commented that the engine was happier running at 700 to 750 rpm. Despite its excellent reputation, the YL did not survive long after the English Electric takeover in 1966 because it competed with the well-established English Electric SV, CSV and RK series of engines. Technical details of the YL can be found on the page Paxman Diesel Engines since 1934. A listing of 255 YL engines in service or on order, based on information available up to 31st December 1966, appears on pages 200 to 204 of the Paxman Sales Engineers' Handbook of c.1967. The listing is by application, customer and engine type and is reproduced in the table below, supplemented with additional information drawn from other sources. Shell Canadian Tankers Ltd, Canada 2 8YLCM 900 750 Twin engined, single screw Tanker - Tyee Shell. British Transport Commission, Hull, Yorks. 2 12YLXM 1125 750 Two single engine, single screw Hopper Barges. MV Anson (754 tons, built 1957) and a sister ship, built by Richard Dunston Ltd, Hessle. Engine rated at 1,057 shp. George Gibson & Co. Ltd., Leith, Scotland. 1 12YLCM 1485 766 Single engine, single screw Cargo Vessel - Lanrick. Swedish State Forest Industries, Stockholm. 4 12YLCM 1485 766 Four single engine, single screw Timber Transporters - Royal Wood, Royal Pulp, Royal Board, Royal Paper. Compania de Navegacion Dalpha S.A., Cuba. 8 16YLCM 1660 750 Four twin engined, single screw Bulk Sugar Carriers - Pinar del Rio, Las Villas, Matanzas, Habana. Atlantic Steam Navigation Co., Tilbury. 4 16YLCM 1660 750 Two single engine, twin screw Car Ferries - MS Cerdic Ferry, MS Doric Ferry. British Columbian Government, Vancouver, B.C. 8 16YLXM 1666 800 Two twin engined, twin screw Car and Passenger Ferries - City of Victoria, City of Vancouver. Ruston and Hornsby, Toronto. 2 8YLCM 1135 1000 Handed engines for Ice-breaking Tug - Amherstburg. Burntisland Shipbuilding for G. Gibson Co. Ltd. 2 8YLCM 1000 750 Liquified Gas Tanker - Teviot. Ent. Dubigeon (Engines built by French Licensees). 2 12YLC 1500 750 Shell Tanker - Cyprea. French Government. 6 8YLZ 940 900 Two triple engined, single screw Meteorological Vessels - MV France I, MV France II. Pecheries de Fécamp, France. 3 8YLCZ 750 750 Triple engined, single screw Fishing Trawler - Cap Fagnet III. Mersey Docks and Harbour Board, Liverpool. 2 12YLXZ 874 600 Twin engined Crane Barge - Samson. Department of Transport, Canada. 4 12YLCZ 1300 750 Four engined, twin screw Vehicle and Passenger Ferry - Confederation. A.E.I. Ltd. for British Transport Commission. 6 16YLCZ 2012 750 Three suction dredgers, 2 engines per vessel - Baglan, Forth (later Abbotsgrange), Swansea (later Lavernock). Drypool Engineering & Drydock Co., for Ross Trawlers. 3 8YLCZ 1135 1000 Distant water stern trawler - Ross Valiant. Ruston and Hornsby, Toronto, for Department of Transport, Canada. 2 12YLCZ 1500 800 Buoy lifting vessel - Simcoe. Compagnie Générale Transatlantique, Great Lakes, Canada. 6 8YLZ 563 750 Great Lakes Cargo Vessels - Chicago, Cleveland - three sets per vessel. Niarchos Ltd., France. 3 8YLZ 480 600 Cargo Vessel - World Felicia. Sinclair Oil Corporation, New York. 3 8YLZ 588 900 Oil Tanker - Thomas B Kimball. Ruston and Hornsby, Toronto, for Marine Industries Ltd., Sorel, Quebec. 4 12YL 820 720 Ice-breaking Ferry. Ruston & Hornsby, Toronto. 4 12YL 820 720 Northumberland Straight Ferry. Lindeteves Jacoberg N.V., Amsterdam. 2 12YLCZ 1700 1000 Italian cutter dredger. Probably P.R. 201-Venezia, a suction dredger built by Vershure & Co Scheepswerf en Machinefabrek, Amsterdam, for Compagnia Costruzioni Generali SRL, Rome. LOA 71m, width 11.5m. Vancouver Public Works, Vancouver, B.C. 1 8YLZ 511 720 Diesel-electric Suction Dredger. Possibly dredger PWD 322, built by Yarrows Ltd, fitted with an 8YLZ driving a 350kW generator set. Amsterdamsche Ballast Maatschappy, Utrecht, Holland. 1 8YLXZ 677 750 Diesel-electric Suction Dredger. Believed to be Amsterdam I built by De Liesboch. Société Français d'Entreprise de Dragages et Travaux Publics, Hong Kong. 3 8YLXZ 720 750 Single engined diesel-electric Bucket Dredger. Probably Estaque, converted by Taikoo Dockyard for this customer. 8YLXZ auxiliary (500kVA). Dutch Cutter Suction Dredger. 1 12YLZ 800 750 Suction Dredger, engine driving sand pump. Probably Fincosita, a suction hopper dredger built in 1957 by Vershure & Co Scheepswerf en Machinefabrek, Amsterdam, for Grandi Lavori Fincosit S.p.a. LOA 78.54m, width 12.37m. Mersey Docks and Harbour Board. 3 16YLCZ 1994 750 Grab Hopper Dredger - Mersey Compass. Société Français d'Entreprise de Dragages (Engines built by French Licensees) 2 8YLCZ 1000 750 Dredger Saggittaire, Hong Kong. Société Français d'Entreprise de Dragages (Engines built by French Licensees) 1 12YLCZ 1720 1000 Dredger in Durban, South Africa. Compagnie Pechiney, Paris, France. 1 8YLC 1000 750 Automatic air starting on mains failure. Metro-Toronto-Island Filtration Plant, Toronto, Canada. 2 8YLC 1050 900 Driving two alternator sets at Centre Island Filtration and Treatment Plant, Toronto. Each engine coupled to an 800 kVA, 4,160 volt, three-phase, 60 cycle alternator for stand-by and peak lopping duties. Lisbon Metropolitano, Portugal. 1 12YLX 1000 750 Remote push button start and stop. Fisons Ltd., Immingham, Grimsby, Lincs. 1 12YLX 1125 750 With waste heat recover boiler. Freetown Electricity Undertaking, Freetown, Sierra Leone, West Africa. 1 16YLX 1292 750 Falconbridge Power Station. Engine direct coupled to a 1,000 kW Bruce Peebles alternator. Pilkington Brothers, Doncaster, Yorks. 2 8YLC 1050 1000 For two automatic starting, mains failure, stand-by alternator sets in glassworks. Each engine direct coupled to a Brush 925 kVA, 415 volt, three-phase alternator. Motala Radio Station, Sweden. 1 8YLC 1135 1000 Automatic starting. Société Pechiney, France. (Built by French Licensees) 1 8YLC 1000 750 Auto air starting. Mains failure. Centrale De Distribution D'Energie Elect. (Built by French Licensees) 2 12YLC 1520 900 Power Station duties. Italian Navy. (Built by Italian Licensees) 4 8YL 530 750 Power Station duties. Crompton Parkinson, for Ministry of Public Buildings and Works. 6 16YLC 1700 750 Electric start. Driving six alternator sets at West Drayton (London) Air Traffic Control. Atomic Power Construction Co. Ltd., for C.E.G.B., Wales. 4 12YLC 1700 1000 Trawsfynydd nuclear power station standby duties. Each engine driving a Crompton Parkinson 1,200 kW alternator. North Thames Gas Board. 2 12YLC 1500 750 These were for two emergency stand-by generator sets for British Gas's liquifaction and storage plant on Canvey Island, Essex. Mike Bellion remembers them having to be 're-commissioned' for insurance purposes due to the fact that they had been idle for a long time and that the site suffered not only from ground movement related to Thames tides but also from 'ground heave' due to a local permafrost induced by the underground storage tanks containing liquified natural gas. A.E.G., Germany. 1 16YLC 1940 750 Battery charging set. R.C.N.R.S., Nova Scotia. 1 8YL 860 900 Emergency duties. Kandia Port, India. 1 8YLX 724 800 Booster Pump for black oils. John Street Pumping Station, Toronto, Canada. 3 12YLX 1215 900 Driving pumps for the city's fire hydrant system. Each engine coupled to a Worthington 12-V 2 DS-I two-stage pump running at 1,725 rpm via speed-increasing gear. City of Ottawa Waterworks,Canada. 2 12YLC 1050 900 Pressurising City Fire Mains. M.I.S.R. Engineering Stores, Cairo, for W. Nubaria Pumping Station. 6 8YLX 755 730 Irrigation. Tractoimport, Cuba. 1 8YL 636 875 Sea water pump drive. Reavell & Co., for North Thames Gas Board. 1 12YLC 1740 900 Compressor drive through speed increasing gearbox. Westland Aircraft, Yeovil, Somerset. 1 8YLX 750 750 Vee Belt drive to Compressors. Compania Shell de Venezuela Ltd., Maracaibo, Venezuela. 6 8YLC 900 850 Generating Sets for Electric Drill Rig. Arabian American Oil Company, Saudia Arabia. 1 12YL 579 750 Generating Set. Arabian American Oil Company, Undaitiyah Camp, Saudia Arabia. 2 12YLX 783 600 Generating Sets. Arabian American Oil Company, Saudia Arabia. 1 12YLX 820 700 Water Injection Pump. A.E.I. Ltd., for British Petroleum Co. 1 12YLCW 1100 900 Generating set on drilling rig Sea Quest. Italian State Railways. (Built by Italian Licensees - Breda) 20 12YLC 2000 1000 Twenty Class D.443 diesel-electric locomotives. Italian State Railways. (Built by Italian Licensees - Breda) 20 12YLX 1400 1000 Diesel-electric Locomotives. 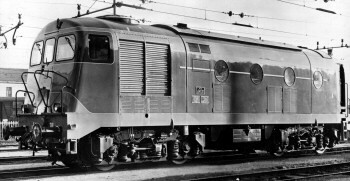 Class D.341. As shown in the first sections of the table above, a good number of YL engines were supplied for marine propulsion (in both gearbox and diesel-electric arrangements), and as auxiliaries. Where more details of the relevant non-naval vessel or vessels are available, there is a link in the table to the relevant entry on the page Marine Applications of Paxman Diesel Engines - Non-Naval Vessels. Please contact me if you are able to assist with identification or details of vessels not named in the above table. Not recorded in the table above are two 12YLCM engines for main propulsion of the David MacBrayne passenger and car ferry 'MV Iona'. The ship was ordered in 1968 and built by the Ailsa Shipbuilding Co, Troon, Ayrshire. She entered service in 1970. The YL engines were each rated 1,600 bhp at 900 rpm, driving a fixed-pitch propeller at 300 rpm through a 3:1 ratio reverse-reduction gearbox. Also not recorded in the table above are two naval applications of the YL. Two 12YLCM engines were supplied for main propulsion of the vessel RMAS Whitehead (A364), a Trials Ship for torpedo research, built by Scotts of Greenock and commissioned in 1971. Twelve YLs were supplied for three United States Navy Salvage and Rescue Ships, USS Edenton (ATS 1), USS Beaufort (ATS 2) and USS Brunswick (ATS 3). These were basically large tugs with ocean-going capability, of 3,125 tons displacement. Each was fitted with four 12YLCM for main propulsion, each rated 1,700 bhp at 900 rpm, driving two propeller shafts through 'two into one' Modern Wheel Drive gearboxes. Built by Brooke Marine of Lowestoft, they were laid down in 1967-68 and commissioned in 1971-72. 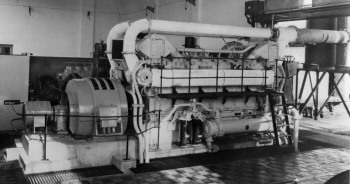 The YL engine was particularly well suited to base load power generation. No less than ten YLs were sold to Peru for this purpose. Right: One of the two 16YLC alternator sets installed in Ica Power Station. Ica (south of Lima) - Two 16YLC, driving 1,880 kVA, 60 cycle, three-phase alternators, running at 900 rpm. Chiclayo - Three 16YLC, driving 1,880 kVA alternators at 900 rpm. Pisco - Two 12YLC, driving 1,410 kVA alternators at 900 rpm. Chincha - One 8YLX, driving a 760 kVA alternator at 900 rpm. The Compania Luz Electrica De Trujillo installed a 16YLC, rated 2,270 bhp at 900 rpm. In the early 1960s Paxman supplied a number of Ventura-engined generator sets to RAF West Drayton. At the time this RAF station, situated 2.5 miles north of London's Heathrow Airport, was the command centre for Britain's 'Linesman' air defence radar system. RAF West Drayton also served as the main centre for military air traffic control in the UK and was home to London's Air Traffic Control Centre for civil air traffic. The critical nature of these functions dictated the need for a constant uninterrupted power supply. Left: The first of the 16YLC alternator sets for RAF West Drayton on a low loader, ready to leave the Paxman Works in October 1966. For various reasons the Ventura sets did not remain long at West Drayton, one being moved to another Linesman site in May 1965 and the others from April 1966 on. They were replaced in 1967 by six 16YLC engines, each rated 1,700 bhp at 750 rpm and driving a 1.2MW Crompton Parkinson generator. I remember the late Denis Turner telling me about the problems experienced with the Linesman Venturas and saying that, when it came to specifying the engines for West Drayton, Paxman persuaded the Air Ministry to use YLs which had proved their reliability in base load generation applications, for example in Peru (see above). By 1996 the YL sets had been running for more than 25 years and clocked up more than 120,000 hours of service. When on-line, the sets normally ran 24 hours a day, at three-quarters load with additional power requirement being imported from the National Grid. In 1996 they were considered easily viable for at least another ten years. (3) RAF West Drayton formally closed in the 1990s. Following the departure of the last remaining civil and military air traffic control systems in about 2007, YL sets ran for the final time on 16th April 2008. (There is a YouTube clip of this event.) The sets were stripped down the following year, ready for export. Four YL engines were supplied for the pumping station of this major project in the Sudan. Work on the Guneid Irrigation Scheme was undertaken for the Sudan Government Irrigation Department, to the design and under the supervision of Sir Alexander Gibb & Partners of Westminster, London. The scheme was designed to provide irrigation for growing cotton, a crop later replaced by sugar. Water was to be pumped from the Blue Nile, up through a rising pipeline, to the main irrigation channel. The site of the pumping station was adjacent to Guneid village, which is approximately 100 miles upstream from Khartoum on the east bank of the Blue Nile. The pumping machinery comprised four Paxman 16YLX 16-cylinder turbocharged engines, each rated 1,500 bhp (site rating 1,365 bhp) at 750 rpm and driving a Gwynne 45" diameter centrifugal pump capable of delivering from 42,000 gallons per minute according to river level. The four pumps were installed in a basement below Engine Room floor level, the drive being arranged to each via a bevel gearbox. It was decided to proceed on the basis of installing two sets in time for the 1955 season, due allowance having to be made for the climatic conditions. The first two YL engines had been delivered by Spring 1955. Paxman also supplied six 8YLX engines for an irrigation pumping station in West Nubaria, Egypt. Eight YL engines, five 16YLC for pumping and three 12YLX for power generation, were supplied for a 660km oil pipeline project in Algeria. The pipeline, running from the Hassi Messaoud oilfield to the port of Bougie (Bejaia), was designed to carry 14 million tons of oil per year. A loan of US$50 million from the World Bank for the project was approved in December 1959. Although it has been said the YL was 'at the beginning designed specially for rail traction' (6) (but see note below), it was not installed in any British locomotive. British Railways considered the YL too heavy for locomotives operating on the UK rail network. The only rail traction customer for the YL was Italian State Railways (FS - Ferrovie dello Stato). All the YL engines supplied to this customer were built under licence by Fabbrica Automobili Isotta Fraschini e Motori Breda of Milan, not by Paxman at Colchester. The Autumn 1955 issue of Paxman's World announced that the YL was to be manufactured in Italy by Breda which had just received an Italian State Railways contract for two locomotives with 12 cylinder engines. The two D.341 Class locomotives, Nos D.341.2001 and D.341.2002, were constructed c.1957-59 and fitted with 12 YLXL engines, rated 1,320 bhp at 1,000 rpm. The first of these entered service during November 1958. Left: The first Paxman-engined D.341 Class locomotive, No 2001, in December 1958. There is some ambiguity about the number of YL engines Breda built for the D.341.2000 series of locomotives. On page 236 of the Paxman Sales Engineers' Handbook there is a picture of D.341.2001 with a caption which starts: "Following the granting of a licence to build YL engines in Italy the firm of Fabbrica Automobili Isotta Fraschini e Motori Breda received an order to supply 32 diesel-electric locomotives of the type illustrated above … ." Another part of the caption reads: "Each locomotive is powered by a 12YLXL engine built by Breda in Italy, having a site rating of 1,400 bhp at 1,000 rpm." However, an Italian book states that the first two locomotives, Nos D.341.2001 and D.341.2002, had 12YLXL engines with ratings of 1,320 bhp at 1,000 rpm. The same book records that the other D.341.2000 series locomotives were Nos D.341.2003 to D.341.2035, which had 12YLXL engines rated 1,400 bhp at 1,000 rpm and were built between 1960 and 1963. Assuming this is correct, Breda built 33 of the 1,400 bhp 12YLX engines (discounting any spares), as well as the two 1,320 bhp ones, making a total of 35 rather than the 32 implied in the photograph caption. The water is further muddied by the fact that the table on page 204 of the Sales Engineers' Handbook , based on information available up to 31st December 1966, only mentions 20 of the 1,400 bhp YLX engines built by Breda. In a recorded interview an ex-Paxman man, who had been responsible for licensing arrangements, said that Paxman found Breda had made more engines than agreed in their licence. One wonders if the number of twenty 1,400 bhp engines given on page 204 was based on the number for which a licence that had been granted, or whether the discrepancies on pages 204 and 236 are just down to human error on the part of the Handbook's compilers. Subsequently Breda built twenty 12YLCL engines, rated 2,000 bhp at 1,000 rpm, for twenty D.443 Class locomotives constructed in 1966-68. Like the D.341 Class, the locomotives D.443.2001 to D.443.2020 were diesel-electric. NOTE: John Cove, who worked at Paxman when the YL was being developed and went into production, queries the assertion that it was 'at the beginning designed specially for rail traction'. He emailed to say the Diesel Railway Traction article "was written in 1955 when dieselisation was still in its preliminary stages and various engine makes and types were being trialled. The first YL was built five years earlier than that and it was designed in the late 1940s when we still had a thriving coal industry and steam trains were the norm. 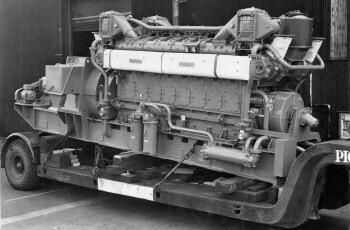 At that time Paxman's main markets for such an engine were industrial generators and marine applications and I simply cannot see why a design destined for these markets should have had any features introduced in its design for possible diesel traction applications which were still well into the future." John went on to say, "Breda saw what was needed for rail traction and after taking a licence immediately redesigned the engine to incorporate an underslung crankshaft and eliminate the heavy baseplate. Somewhat against our wishes at the time they also converted nearly all the dimensions into the metric system so the Breda engine parts were not necessarily interchangeable with Colchester-built engines because with fine tolerances direct conversion does not always work very well. If I remember correctly we insisted that the pistons should remain exactly in UK dimensions because all the development work we had done would otherwise be wasted and reliability could not be guaranteed. There was also an issue with the bolts securing the big end bearings to the connecting rod. Any failure of these would wreck the whole engine. Breda wanted to use the UNF system which was then in its infancy while Paxman used the well-proven BSF threads. Paxman looked at the tolerances of the UNF bolts and felt that they were too wide and if the bolt was on the minimum tolerance while the nut was on the maximum the threads, instead of bedding together nicely to spread the load, would be more towards tip to tip contact and the resulting bending moment might cause the threads to fail. Either the authorities amended these tolerances later or Paxman were being unduly cautious because the UNF system causes no worries these days. For these reasons I do not think that we sent them any complete Colchester-built engines for trials although no doubt we supplied some of the pistons, bolts etc. referred to above." An important source of information about the YL engine is the Paxman Sales Engineers' Handbook , (sometimes referred to by Paxman folk as 'the blue book'), c.1967-68, pp.181-242. 1. Diesel Railway Traction , July 1951, pp.145-6, 156. 2. Paxman Sales Engineers' Handbook , c.1967-68, p.235. 3. Connect (GEC Althom Diesels Ltd Newsletter), No 5, Autumn 1996, p.6. 4. Paxman's World , No 20, Spring 1955, p.10. 5. Paxman Sales Engineers' Handbook , c.1967-68, p.226. 6. Diesel Railway Traction , March 1955. '25 Years of Railway Oil Engine Building', pp.76-82. 7. Paxman Sales Engineers' Handbook , p.236.